Pebble is now taking pre-orders for its high-end Pebble Time Steel smartwatch, though it won’t ship until late September at the earliest. The $250 timepiece includes a leather band and stainless steel chassis, either in gunmetal black with a black band, silver with stone leather, or gold with red leather. For $50 more, you can get a matching stainless steel link band instead. Aside from premium design, the Pebble Time Steel is 1 mm thicker than the Pebble Time, and advertises 10 days of battery life instead of seven days. 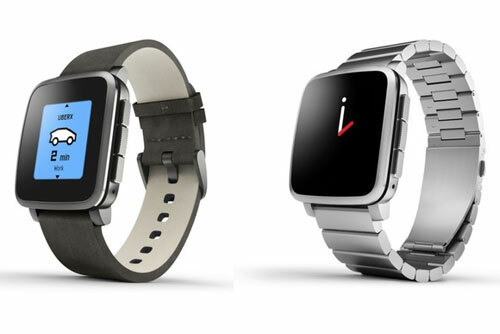 Otherwise, it’s identical to the Pebble Time—at least on paper. According to some early reviews at Gizmodo and The Verge, the Pebble Time Steel’s display is brighter and closer to the surface glass, making it much easier to read indoors. Having used the Pebble Time myself, I believe this alone could be reason enough to buy the Steel instead. If you’re unfamiliar with the Pebble Time, think of it as a low-maintenance alternative to the Apple Watch and Android Wear watches, compatible with either operating system. It’s not as powerful, it lacks a touch screen, and its display isn’t as vivid, but you don’t have to worry as much about charging it or keeping it dry, and the always-on display means you don’t have master a wrist flick gesture to check the time. Why this matters: While Pebble is already selling the Pebble Time in retail stores, the company hadn’t previously said when it would start selling the Steel version to the general public. If you recently bought a Time and are having second-thoughts about the display readability, sending it back and sticking it out for another couple months wouldn’t be a bad call at this point.